Exploring the Outdoor Classroom: Dramatic Play Ideas - Outdoors! Kids love dramatic play. 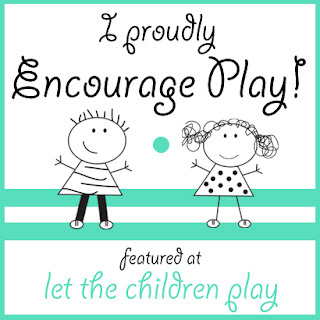 Whether it is in the classroom, in the woods, or in the play yard, dramatic play is always one of the most popular centers in which the children congregate. 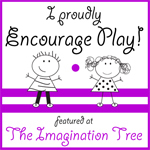 Dramatic play allows children to make sense of the adult world in a child-friendly setting. 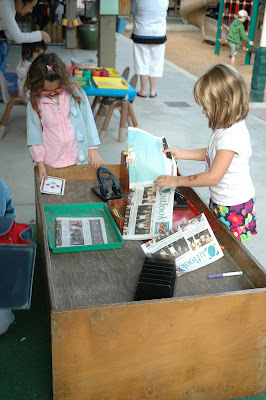 Dramatic play also develops necessary skills in cooperation, language, role-play, and leadership. 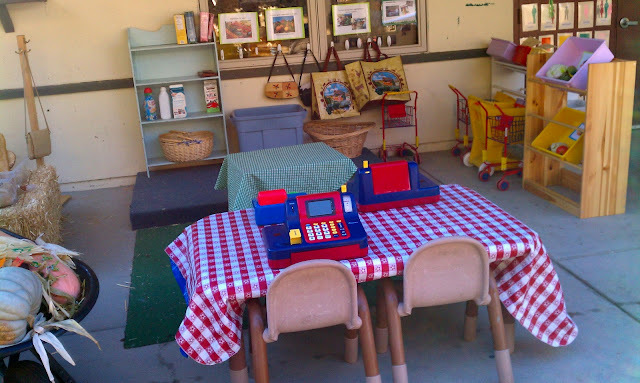 Children love to play in a dramatic play setting that has been designed around a theme. 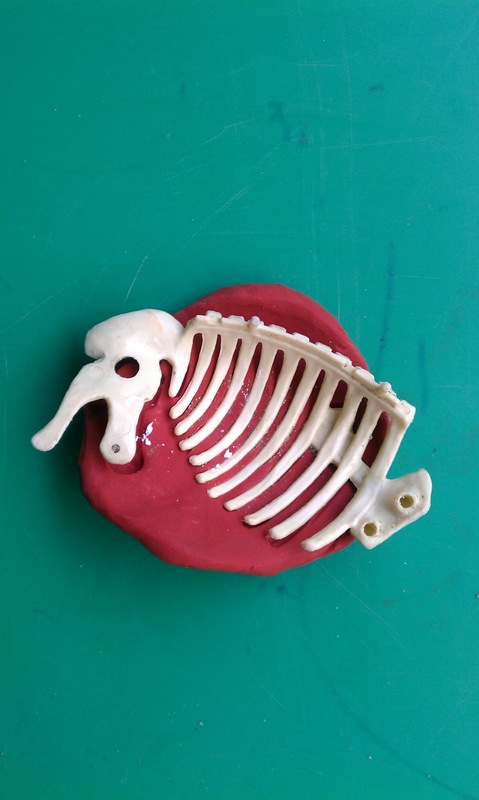 Providing ample props engages the children in the theme and allows them to make believe their own scenarios. The key to a successful dramatic environment is providing enough props for several children to avoid conflict. The benefit of providing dramatic play outdoors is that the children can use more of the environment to enhance their play. 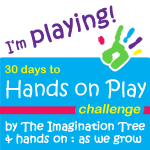 They can also let loose a bit as they can use more of their body to engage in play. They can be louder, busier, and even incorporate the structure, bikes, or sandbox! Our younger pod enjoyed the small scale Country Kitchen (crossed with the Mud Kitchen approach). The teachers put the kitchen near the sandbox to encourage the children to use the sand and other natural items they had set out. Farmer's Market - We set out four shopping carts, several shopping bags, purses, several cash registers, and play money. 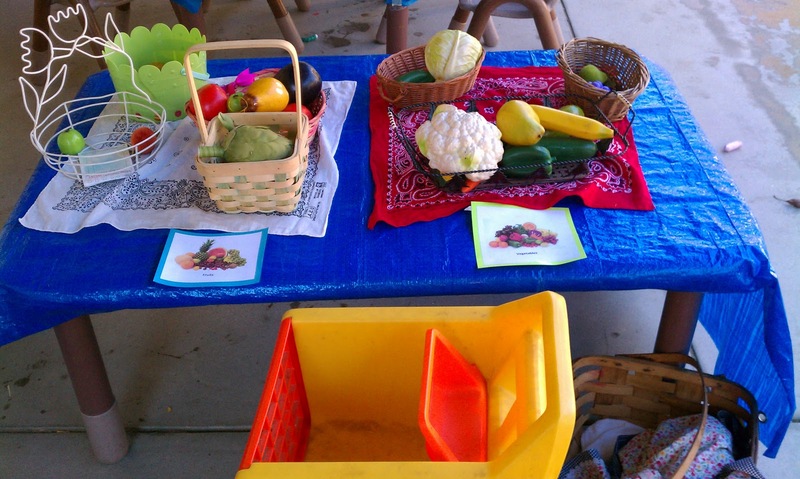 We added labeled bins and shelves filled with fruits, vegetables, bread and dairy products. Western Cook Out - Cowboy hats, flannel shirts, bandanas, plastic plates and utensils, and aluminum cookware with LOADS of plastic camp food made this theme a big success. The kids really enjoyed the giant ham and steak! Every week, we add a few special items to add interest to the theme. This time, we added a campfire and tripod. 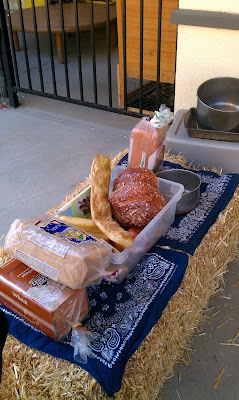 The kids had a great time cooking the ham and hot dogs over the fire. We even added a hanging lantern for effect. Fire, Fire! 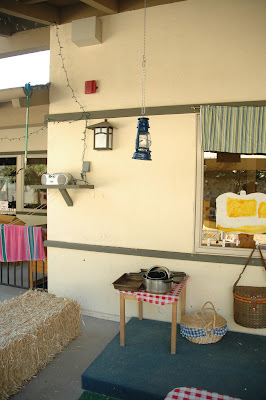 During the summer, teachers inspired a fire house theme. 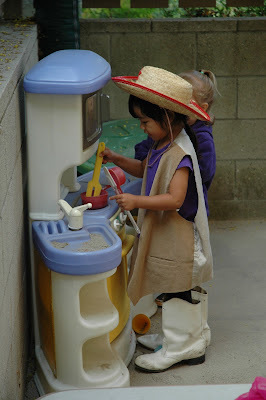 They added yellow boots, fire hats, cut-up garden hoses, plastic fire extinguishers, and plastic fire coats. The children were allowed to take the gear all over the playground to extinguish fires (they just had to bring it all back at the end of their play time). They even made the tricycles into fire engines! 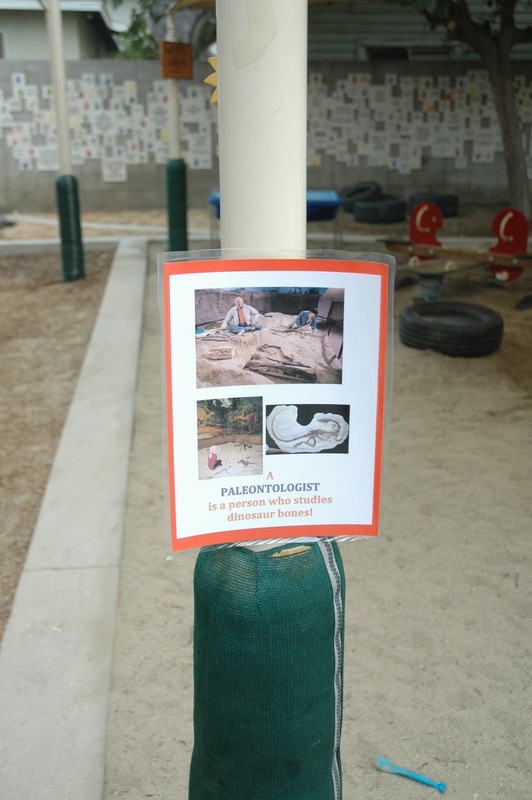 Dino Dig - Here we added a table filled with sand, dinosaur skeletons, hand-made fossils, and paint brushes for brushing off their treasures. Paleontology Lab - Directly beside the dino dig, we place another table filled with laboratory gear such as goggles, beakers, and magnifying glasses. Adding photos and language around the yard inspires curiosity in Language and Literacy. Teddy Bear Picnic - The children enjoyed LOADS of teddies and stuffies. 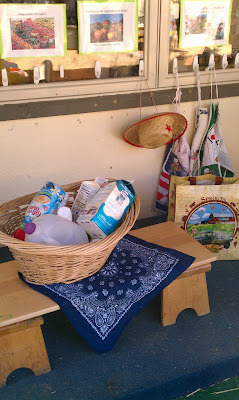 We added pitchers, cups, plates, baskets, and a quilt to make the perfect picnic setting. Post Office - This theme features mail boxes, US Mail Tricycles, newspaper, paper, cards, envelopes, stickers, stamps, clipboards, tape, and hole punchers. You name it - if it was good for writing or posting, we provided it! Other ideas include: Play House, Police, Bakery, Pumpkin Patch, Garden, Weather Station, TV Station, Rock and Roll Stage, Nautical or Pirate Boat, Castle, or Shoe Shop. 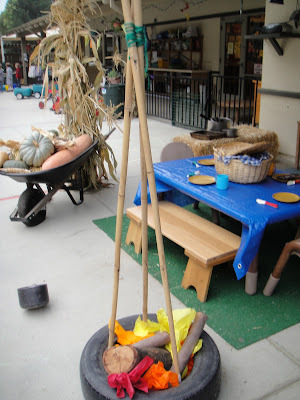 Have any other great ideas for Outdoor Dramatic Play? 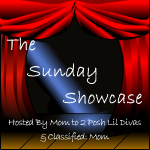 Mention them here and provide a link if you have one! I know...we are very spoiled! I grew up in Vancouver, Canada, so I completely understand the weather dilemma! We had a saying there that say, "we don't get old, we just rust out!" Though it doesn't rain often, we still keep our dramatic play center under the covered area of the yard (against the main building). This way, the children can still use a few of the activities even in the rain! Wonderful! 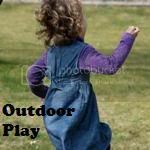 Thanks so much for linking up with us at the Outdoor Play Party! These set-ups look so inviting I want to come play myself! This is awesome. 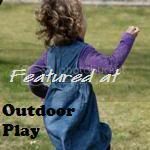 Did you see the blogger that joined the outdoor play link up last week that set up an outdoor shoe store for her kids? I loved that! Takes some work but I think setting up that kind of play outside is wonderful. 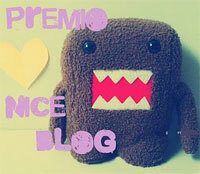 So excited to share your post with my blog readers in a few days. 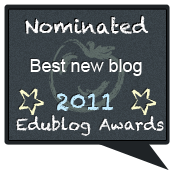 I just found your site through the edublog awards, and was interested in finding out where in socal you are. I'm in OC, and am looking for a program like this for my son (2 now). Are you nearby? Or,if not, do you know of a program like this in OC? Thanks! For now, I'll just focus on doing some of these things at home! I did see the shoe store...a girl's dream for dramatic play! ;-) You are right about it taking work! We usually change the theme every 2 weeks (or 3 weeks if it is particularly elaborate) but it takes a a lot of time and preparation!! But totally worth it when the kids run out to find a fantastic new set-up waiting for them! Hope you are having a great vacation! I took a side trip to the beach with my boys today and it was SO relaxing! We even found some live starfish...the highlight for my 5 year old! What a gorgeous outdoor classroom. Where did you get those green, yellow and red exploration trays? I love the camp fire too.